Six months ago, I came across some custom jumbo vinyl works by Spencer & Stephen Ong and I was really fascinated by them. 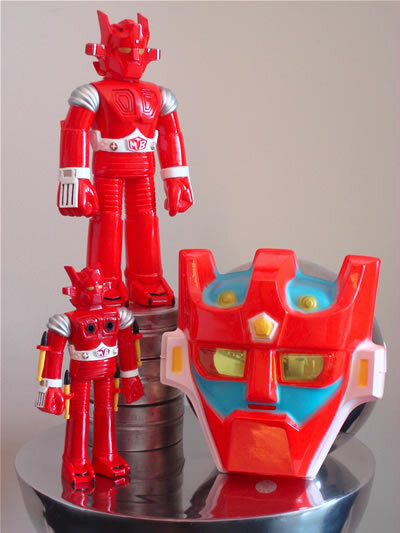 The brothers did some beautiful one of a kind pieces like Mekanda Robo, Voltes V, Gaiking, and Daimos. Being a designer, I really appreciated the level of craftsmanship and detail that they put into each piece. 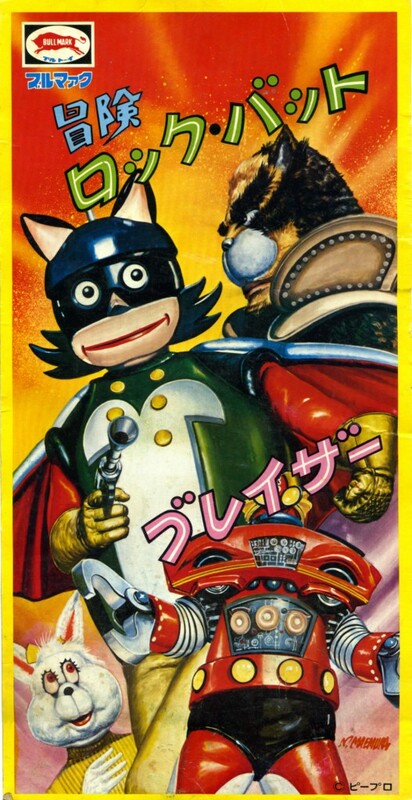 Well, my friends here know I have a thing for Mach Baron and that got the gears in my head spinning. “I wonder if these guys can make me a custom Mach Baron?”, I thought. So that’s how it all began. I got in touch with Spencer and said I would like to commission them to create a Mach Baron. “Sure, we can do a custom Mach Baron.”, said Spencer. After some emailing back and forth, we agreed on a timeline, price, etc. 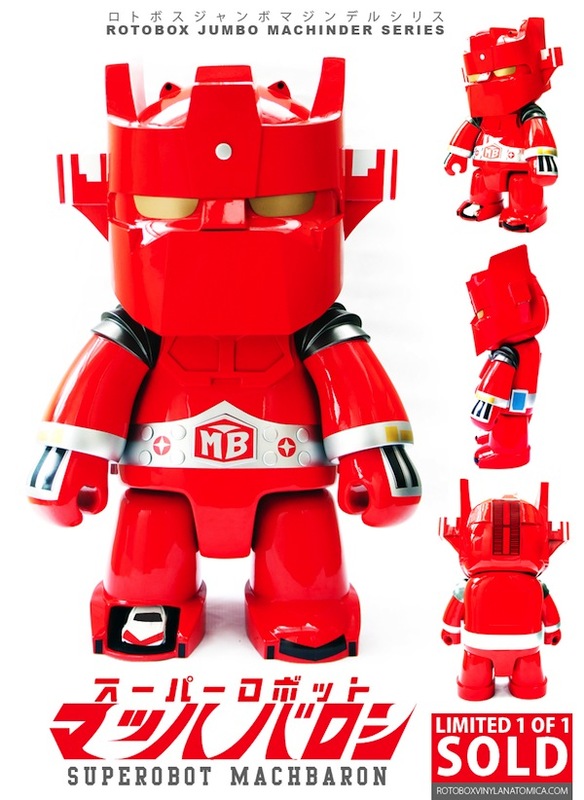 I sent him some photos of Mach Baron and requested certain Tamiya colors for the figure. And away they started with the work. Spencer was really quick in turning around some sketches. I gave him my feedback and had him tweak Mach’s eyes to my liking. It was a nice collaborative effort. Spencer would periodically send me photos of their progress. 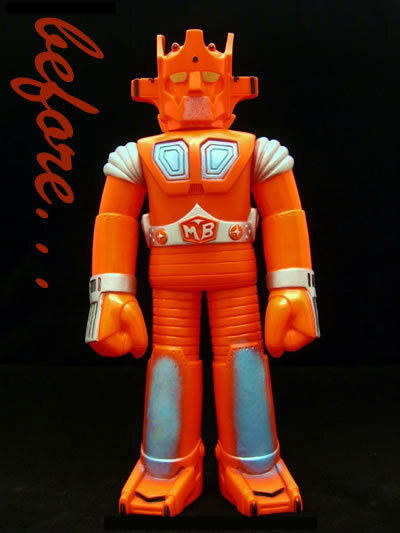 I learned a lot about how they went about sculpting a generic vinyl cast into a Mach Baron. It was all fascinating to me. When I finally saw the finished piece, I was more than please…I was BLOWN AWAY! I got everything I asked for and more. These guys are truly dedicated to their craft. 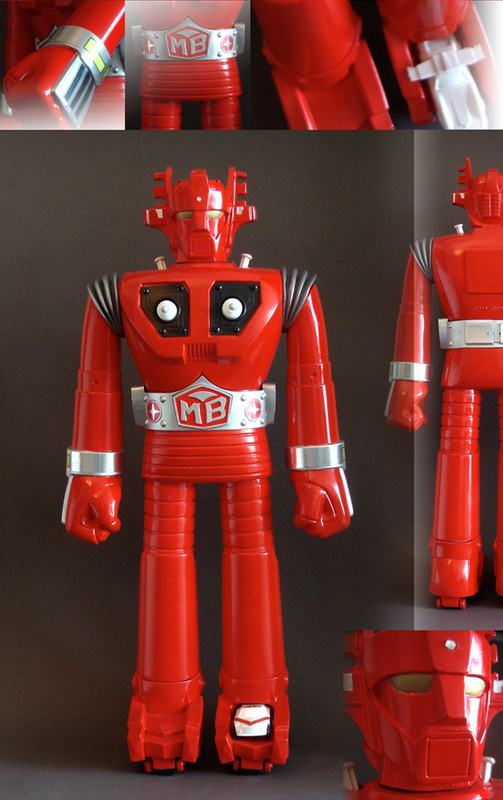 I have many wonderful Mach Barons in my collection but this one by the Ong brothers is definitely a MASTERPIECE that I will treasure. If you would like a custom piece of your own in 6″, 8″, 16″, or 24″, I recommend you contact these two da Vinci brothers at info@rotoboxvinylanatomica.com or on Facebook at https://www.facebook.com/rotobox. My collection of Mach Barons. Most were given a custom makeover. It took much time and a steady hand to paint them but the effort was well worth it! Click on the graphic above to visit the fan page. Feel free to “LIKE” it, so you can get the latest Wall postings. This is a video I created showcasing a group of Super Robot Mach Baron illustrations set to the TV showâ€™s opening theme song. Hope youâ€™ll like it. 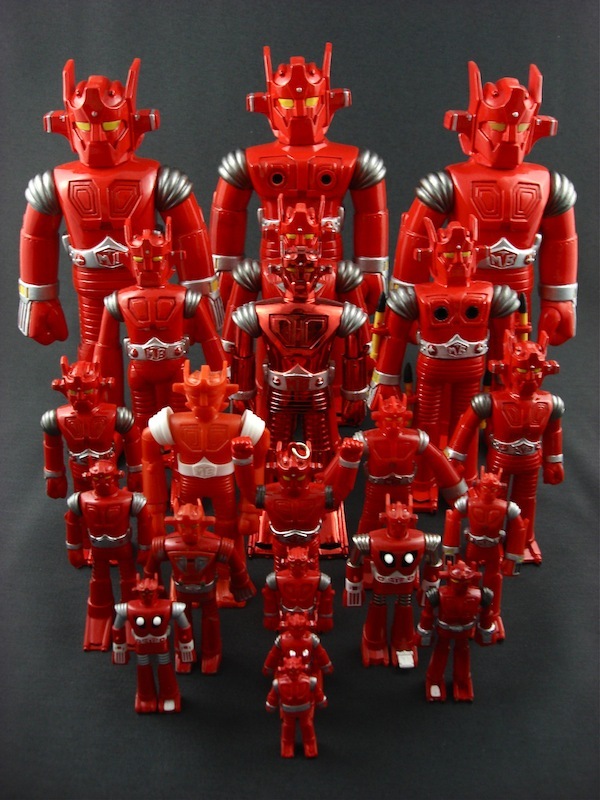 I’m a big junkie for Mach Baron like some of my friends here.Â Come on, who doesn’t love a giant red robot that’s so beautifully designed he turns heads? I think the figures from Bullmark are just wonderful sculpts of art. With that said, I do have a pet peeve about them. So many were poorly painted. Mach looks like he has a bad spray on tan. Come on…where’s the respect? 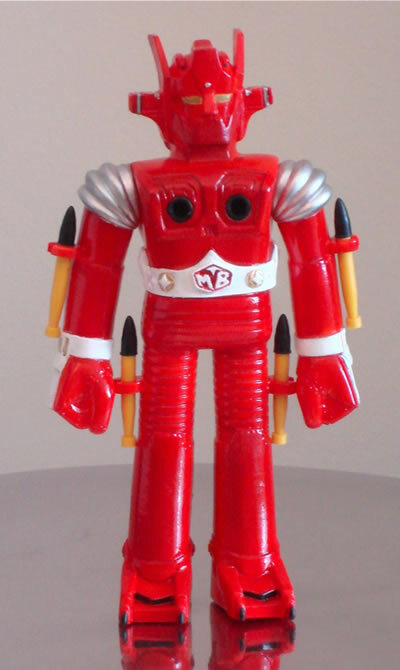 I looked at my 10.5″ Bullmark sofubi one afternoon and thought, “I wonder if I could repaint him to show off his TRUE colors?” After researching and looking at many photos of Mach Baron, I narrowed down some colors and came up with a game plan. I started by using a thinner to remove as much of the excess blue silver color on his shins as possible and other colors incorrectly sprayed onto him. After that, it was time to mask off his belt, hands, and eyes. Then I applied two coats of bright red spray paint. When it dried, off came the masking tape and then the fine work of painting the white, silver and gold yellow. After about 3 hours invested in this makeover, I surprised myself with the results. He looks 100x better!! 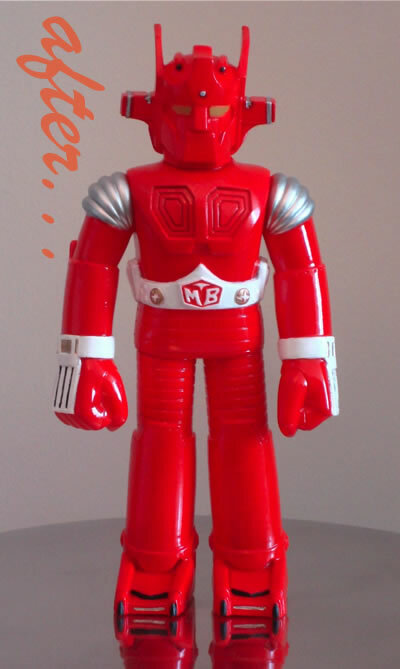 Since it worked so well on the sofubi, I decided to give my MFV Mach Baron a facelift too. And finally, here is the family portrait. It took me awhile to collect these incredible illustrations which I think make great postcards. Enjoy! I think the illustrationsÂ by N. MaemuraÂ really ROCKS!!! 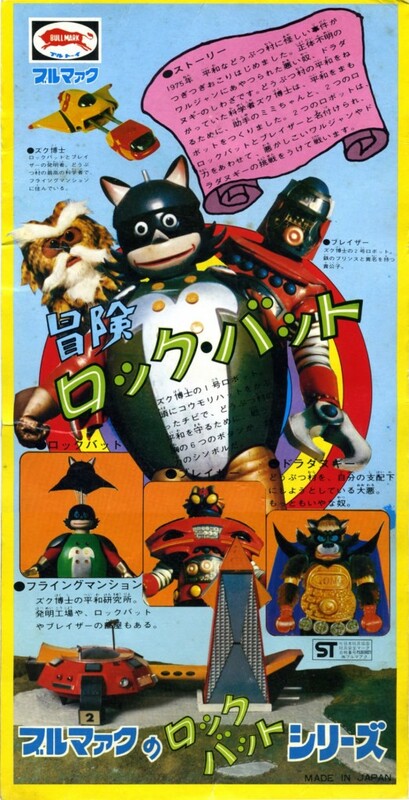 This card insert was for a Blazer sofubi. I knew I had to add it to my collection the moment I saw it. This is the back side to the card insert above. Now, where do I find that retro looking base station? 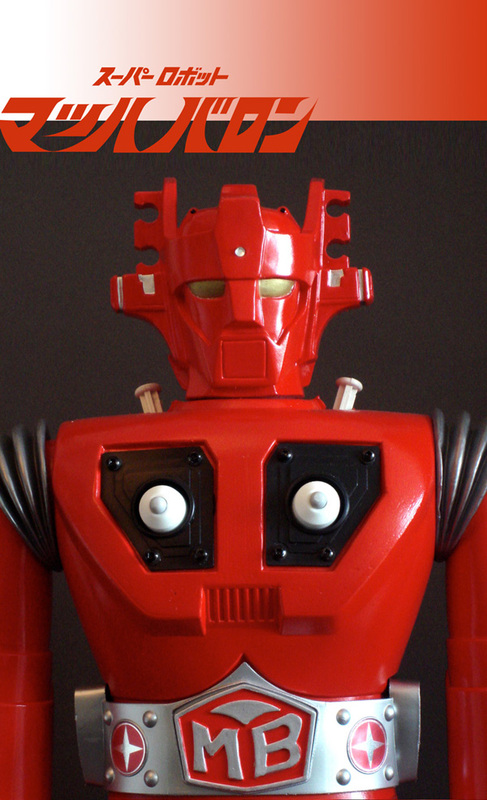 One of my favorite all time robots ever...T28. 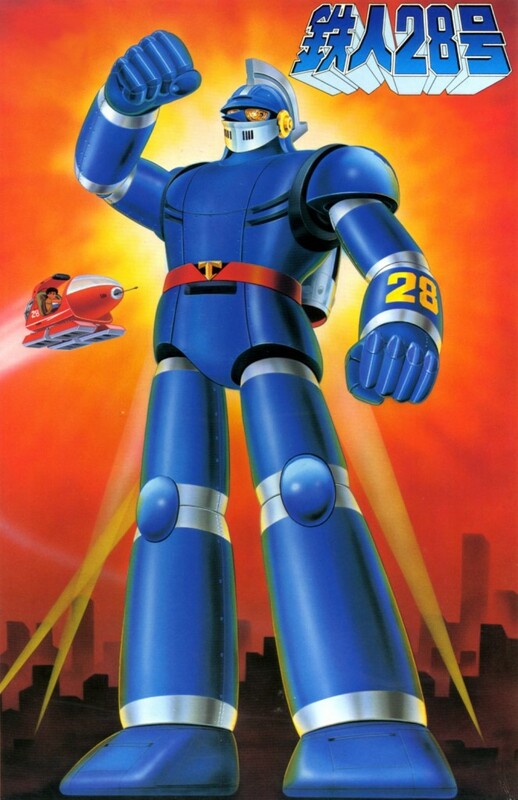 Picked up this model kit recently and I'm looking forward to painting and putting him together. 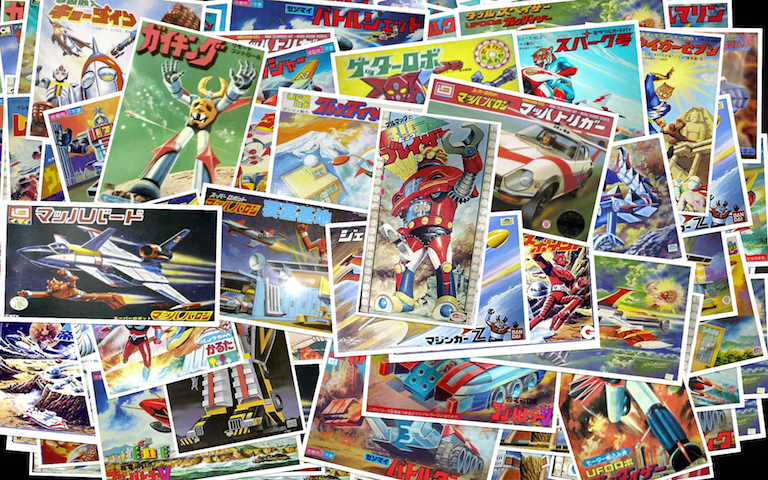 Got to admit I am a junkie for great Japanese robot box art illustrations! !